Attorney Puglisi discusses unique aspects of criminal defense law in the criminal justice system in this podcast. Attorneys Sabrina Puglisi and Dianne Carames represent a worker who paid cash for “order of supervision” papers to a man who fraudulently represented himself as an immigration officer. Miami Herald: Workers paid cash to ‘immigration officer’ to get papers – but he wasn’t legit. Attorney Sabrina Puglisi represents a person who attempted to purchase a drivers license from someone who pretended to be an immigration agent. Univision: Acusan a un hombre de vender licencias de conducción a indocumentados y ahora ellos también están en problemas. Attorney Sabrina Puglisi was was recently elected Treasurer of the Dade County Bar Association (DCBA). Renato Rodriguez, a Brooklyn transplant with working-class roots, was sentenced to 7 1/2 years in prison for his supporting role in a $3.6 billion money-laundering scheme built upon illegal gold imports from Latin America. Prosecutor Francisco Maderal proposed a maximum 10-year prison sentence for Rodriguez, while Rodriguez’s defense attorney, Sabrina Puglisi, asked the judge to give her client eight years because of his remorse, commitment to his family, community service work and lesser role in the money-laundering conspiracy. (Miami Herald January 31, 2018). A Miami federal judge said she was struggling with the “paradox” of the good and bad sides presented in court about sports agent Bart Hernandez and trainer Julio Estrada, who were found guilty of smuggling Cuban baseball players into the United States to capitalize on their multimillion-dollar major league contracts. In the end, despite the government’s request for a sentence of more than ten years, U.S. District Judge Kathleen Williams sentenced Mr. Estrada to 63 months, only 3 months more than attorney Sabrina Puglisi’s request (Miami Herald November 2, 2017). On Friday, July 22, 2016, Sabrina Puglisi’s client David Hom was released from prison after serving over four years imprisonment. He was originally sentenced to 220 months. As a result of the Supreme Court’s ruling in Johnson v. United States, the burglaries that were used as priors to enhance Mr. Hom’s sentence no longer qualify as “crimes of violence”. His sentence was reduced down to 37 months imprisonment. The Johnson case has the ability to affect thousands of people sentenced to enhanced penalties. Check out this article in the Daily Business Review “US Supreme Court Takes on Shotgun Sentencing Appeal“. I felt Sabrina was truly on my side; every step of the way I knew without a doubt that she was dedicating all of her efforts to help me. It truly felt as if I was her only client. She is also smart, knowledgeable and a professional. I don’t wish anyone will ever have to be in my position but if you are, then you want to have her as your advocate. When you have been accused of committing a crime your whole world collapses, life as you knew it for yourself and your family is gone, in one single moment. It has to be one of toughest journeys any human being can encounter. There is only one factor that allowed me to keep my sanity and hope that things would work out in the best possible way, my defense attorney Sabrina Puglisi. I don’t know that I will ever meet a kinder human being. It is not often that intelligence, responsibility, sincerity, creativity, and genuine kindness come wrapped in one package but Ms. Sabrina Puglisi brings just that to all her cases. Ms. Puglisi is an extraordinary woman who did a wonderful job representing my son. I was very impressed by her diligence and work ethic. Miami criminal attorneys Sabrina Puglisi and Dianne Caramés have earned a reputation as dedicated and successful defense lawyers with integrity and empathy. They have extensive experience as criminal trial lawyers and their unique blend of compassion and hard work allow them to achieve great results for their clients. Sabrina Puglisi is a Florida Board Certified Criminal Trial Attorney. While not all qualified criminal lawyers are board certified, those who are board certified have taken the extra steps to have their legal competence and experience evaluated. Certification is the highest level of evaluation by The Florida Bar of competency and experience within an area of law, and demonstrates outstanding professionalism and ethics in practice. Attorney Puglisi is one of only approximately 370 board certified criminal trial attorneys out of 85,000 practicing lawyers in Florida. Miami criminal attorney Sabrina Puglisi formerly practiced at the State and Federal Public Defender offices. This experience has given Attorney Puglisi the unique perspective of knowing both systems from within. She has an excellent reputation with judges, prosecutors, probation officers and court personnel. Attorney Puglisi is highly respected and consulted by the most proficient practitioners in the criminal law field. Ms. Puglisi is a past-president of the Florida Association of Criminal Defense Lawyers (FACDL), Miami Chapter, and is a representative to the statewide organization of FACDL. Her active participation in the legal community fosters good communications and relationships with members of the judiciary and criminal attorney colleagues. Attorney Sabrina Puglisi is recognized as one of the best trial attorneys in the state by the National Trial Lawyers Association. 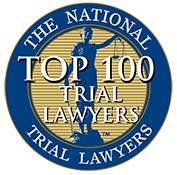 The National Trial Lawyers: Top 100 is an invitation-only organization composed of the premier trial lawyers from each state in the nation who meet stringent qualifications as civil plaintiff and/or criminal defense trial lawyers. Selection is based on a thorough multi-phase process which includes peer nominations combined with third-party research. Membership is extended solely to the select few of the most qualified attorneys from each state who demonstrate superior qualifications of leadership, reputation, influence, stature and public profile. As criminal lawyers, what truly sets Sabrina Puglisi and her firm apart is their ability to understand and empathize with an accused through his or her journey through the criminal justice system. Attorneys Puglisi and Caramés understand the impact of criminal charges, not just on the accused, but on the loved ones. They always have two goals in every given case. First, to vigorously defend each criminal defendant client in order to achieve the best result. Second, to aid in maintaining and supporting the integrity of family. They know how important family is, especially when someone may be held in detention pre-trial and unable to maintain regular contact with their spouse, partner, parent, or child. Clients will receive exceptional service. An attorney will always return calls of clients and family members immediately. Each criminal defendant is treated as a partner in their representation. The attorneys understand that the person who knows their case the best is the client. For this reason, the attorneys in this law firm will always ask the client for their input in defending their case. Clients will never be dictated to; rather, they will understand every step of the process and will be active participants in their defense. For this reason, the attorneys will be in constant contact with the client to advise them of where their case is and where it is heading. Ms. Puglisi runs a boutique law firm, meaning that she accepts a limited number of clients. She does this because she wants each client to understand that they are important to her and so that she has the necessary time to achieve the best result for the client. Sabrina Puglisi will guarantee that the client will never feel abandoned or ignored, whether the case is in hiatus or not. In each defense, attorneys Puglisi and Caramés incorporate the whole support structure of the accused, meaning that they will use family, friends and the background of a client to help in achieving the desired result. They do this because they recognize the full impact of a criminal prosecution on a client and his or her family. The Law Offices of Sabrina Puglisi is not a firm solely concerned with getting cases and earning money. The attorneys will always spend time to get to know their clients by asking what brought them to this place, asking them about their family and their expectations for the future. Attorneys Puglisi and Caramés use their knowledge of each client whether by showing that human side to a jury in a trial, obtaining a better sentence through mitigation, or convincing the government not to file criminal charges. Above all else, the truth matters to Sabrina Puglisi. Her firm will never provide a client with false expectations; instead, the attorneys will be honest so that the client will always know where he or she stands. Attorneys Puglisi and Caramés care about people and their main concern is to procure the best result for each client within the bounds of ethics. The Law Offices of Sabrina Puglisi, a Miami criminal law office, is conveniently located in the penthouse suite directly across the street from the United States District Courthouse in Miami. From these offices, she represents defendants in Dade County (Miami), Broward County (Ft Lauderdale), Monroe County (Key West), throughout Florida and the United States. Attorney Puglisi is admitted to practice in Florida state courts and Florida federal courts (Southern District, Middle District, and Northern District), the District of Colombia, Federal courts throughout the United States and the Eleventh Circuit Court of Appeals. Learn about Miami criminal defense lawyers Sabrina Puglisi and Dianne Caramés.